Doesn’t this image just make you want to sink back in your chair and daydream? I love the soft collection of blues, like a stylist set it out ‘just so’ for a magazine shoot. I love the delicious textures of the thatched roof houses, like nature, both unique and uniform. I love the way the ocean quickly softens in the background while the focus is only where you want to look. I love the three small children who spend all their days in a small canoe treating the vast blue ocean as their play-thing. 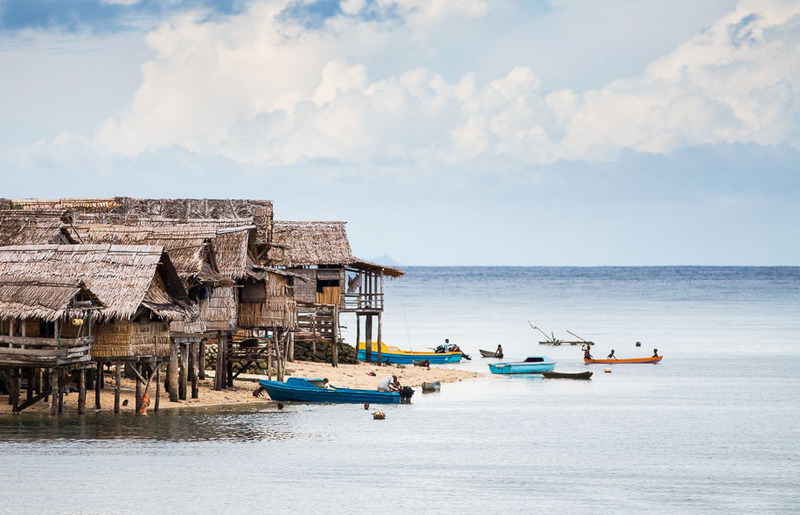 In July I was on my way back to the Solomon Islands capital after spending a few days on the island of Malaita collecting stories on an ethnoarts workshop. I was half asleep when the small river-cat arrived in this small harbour after a tumultuous four-hour journey a few days before, so I had my camera ready for our departure. Wielding a massive Canon 70-200 f/2.8 II with hood attached I decided to conduct an experiment. Usually, you’d keep the aperture stopped down a bit to capture a scene like this, to get maximum depth of field. But I wondered what a landscape scene would look like with the aperture opened all the way out to f/2.8. Well, I got my answer, and I love it. The combination of 200mm lens compression and f/2.8 makes for a monster of a lens but an otherwise unachievable effect. We can enjoy the beautiful texture of the village houses and the dreamy softness of the blue haze at the same time.